One of the big ticks on UK trad climbing is Lundy island. it’s a chunk of granite with a pub on top, trad climbing heaven! Please read the accommodation/ferry booking notes, the island was fully booked before the trip in 2018, and we expect it be fully booked months before the meet in 2019, which is the reason for opening the sign up early, we strongly advise booking to avoid disappointment . We are planning on camping on the Island, unfortunately for technical reasons, we have not been able to book a group pitch for 2019. This means members need to book their own camping and ferry. please book your pitch through the Landmark trust website we are heading to the island on the 10-17th August 2019, please select sat 10th as your start date. The landmark trust website may initially multiply your camping amount by 10, but don’t panic it corrects itself when you click through to the next page. UPDATE: After you have booked accommodation they will hold your space on the ferry up to two weeks before travel but you can’t officially book and pay until next year, we will email everyone who has signed up in the new year to remind you to book the ferry as soon as it’s available Once you have booked Please sign up for this event, as we need to let the island know we are coming, and keep you updated. Lundy has the biggest slab of granite in the UK, the Devil’s slide, and a host of quality routes. 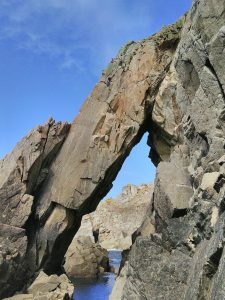 Several members have Lundy guide books, so if you want to have a detailed look at the routes on the island, and I’m sure they would love to tell you all about it! 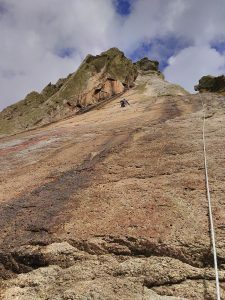 As most of the climbing on Lundy is tidal, experience of climbing multi pitch trad on sea cliffs is essential here, we would recommend that you are in your “comfort zone” leading HS, the slabby routes can be quite run out and committing. we have picked dates to try and give the maximum amount of climbing. After feedback from the groups who have been to the island, We are heading to Lundy for a week, to provide a decent amount of days to climb. The the travel to/from the island takes the best part of the day, and we are likely to get at least one wet day, it was felt that a long weekend simply wasn’t awesome enough! The 10-17th August 2019, is Sat – Sat, with midday low tide occurring mid week. The tide is an important factor in this trip, many of the crags are tidal, and Lundy is at the mouth of the Bristol channel which has the second largest tidal range in the world. The Pub serves food, all day, so you can eat out as well as cooking on the campsite, there is also a small shop on the island which offers an impressive variety of food, drink and gifts. Please take extra care to look after this place.